When dealing with a hazmat leak, which of the following applies? If you discover a cargo leak, identify the hazardous materials leaking by using shipping papers, labels or package location. Do not touch any leaking material � many people injure themselves by touching hazardous materials. Do not try to identify the material or find the source of a leak by smell. Many toxic gases destroy your sense of smell and can injure or kill you even if they do not smell. Never eat, drink or smoke around a leak or spill. If hazardous materials are spilling from your vehicle, do not move the vehicle any more than safety requires. You may move off the road and away from places where people gather, if doing so serves safety. Only move your vehicle if you can do so without danger to yourself or others. Never continue driving with hazardous material leaking from your vehicle to find the nearest safe location where communication can be made. Remember that the carrier pays for the cleanup of contaminated parking lots, roadways and drainage ditches. The costs are enormous, so do not leave a lengthy trail of contamination. The shipping name, hazard class and ID number of the hazardous materials from the shipping paper. Your name, the carrier�s name, and the name of the community or city where your terminal is located. Never move your vehicle if doing so will cause contamination or damage the vehicle. 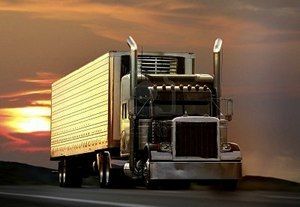 Keep any fumes or product away from roadside rests, truckstops, cafes and businesses. Never try to repack leaking containers. Unless you have the training and equipment to repair leaks safely, do not try it. Call your dispatcher or supervisor for instructions and, if needed, emergency personnel. If your vehicle has a breakdown or accident while carrying explosives, warn others of the danger. Keep bystanders away. Do not allow smoking or open fire within 25 feet of the vehicle. If there is a fire, warn everyone of the danger of explosion. Remove all explosives before pulling apart vehicles involved in a collision. Place the explosives at least 300 feet from the vehicles and occupied buildings. Keep others and yourself a safe distance away. If compressed gas is leaking from your vehicle, warn others of the danger. Only permit those involved in removing the hazard or wreckage to get close. You must notify the shipper if compressed gas is involved in any accident. If a flammable solid or oxidizing material spills, warn others of the fire hazard. Do not open smoldering packages of flammable solids. Remove them from the vehicle if you can safely do so. Also, remove unbroken packages if it will decrease the fire hazard. It is your job to protect yourself, other people and property from harm. Remember that many products classed as poison also are flammable. If you think a Division 2.3 (poisonous gases) or Division 6.1 (poisonous materials) might be flammable, take the added precautions needed for flammable liquids or gases. Do not allow smoking, open flame or welding. Warn others of the hazards of fire, inhaling vapors or coming in contact with the poison. The National Response Center must be called whenever which of the following occurs as a result of a hazmat incident or accident? Fire, breakage, spillage or suspected radioactive contamination occurs. The National Response Center helps coordinate emergency response to chemical hazards. It is a resource to the local police and firefighters. The center maintains a 24-hour, toll-free line. What class hazard is Asbestos? A shipping paper describes the hazardous materials being transported. Shipping orders, bills of lading and manifests are all shipping papers. What secondary hazard requires additional placarding regardless of amount carried? Materials with a secondary hazard of dangerous when wet must display the DANGEROUS WHEN WET placard in addition to any other placards needed by the product�s hazard class. The 1,000- pound exception to placarding does not apply to these materials.